Upright: Negative thoughts, self-imposed restriction, imprisonment, victim mentality. Reversed: Self-limiting beliefs, inner critic, releasing negative thoughts, open to new perspectives. 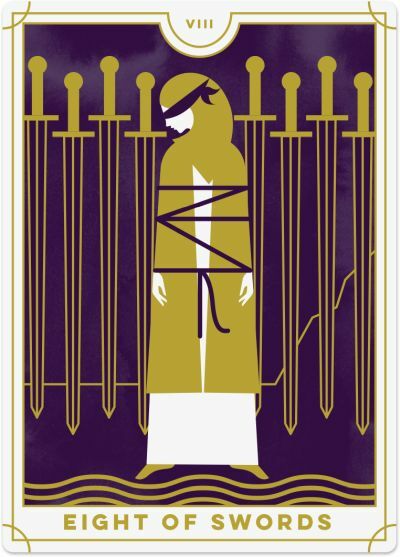 The Eight of Swords shows a woman bound and blindfolded. Eight swords surround her, seemingly trapping her in place, a symbol of the limiting thoughts, beliefs and mindset that prevent her from moving forward in her life. However, look closer: if the woman removed her blindfold, she would quickly realise that she can escape her predicament by letting go of her limiting beliefs and establishing a new, more empowered mindset. The water pooled at her feet suggests that her intuition might see what her eyes cannot. The Eight of Swords reveals that you feel trapped and restricted by your circumstances. You believe your options are limited with no clear path out. You might be in an unfulfilling job, an abusive relationship, a significant amount of debt or a situation way out of alignment with your inner being. You are now trapped between a rock and a hard place, with no resolution available. However, take note that the woman in the card is not entirely imprisoned by the eight swords around her, and if she wanted to escape, she could. She merely needs to remove the blindfold and free herself from the self-imposed bindings that hold her back. When the Eight of Swords appears in a Tarot reading, it comes as a warning that your thoughts and beliefs are no longer serving you. You may be over-thinking things, creating negative patterns or limiting yourself by only considering the worst-case scenario. The more you think about the situation, the more you feel stuck and without any options. It is time to get out of your head and let go of those thoughts and beliefs holding you back. As you change your thoughts, you change your reality. Replace negative thoughts with positive ones, and you will start to create a more favourable situation for yourself. The Eight of Swords assures you there is a way out of your current predicament – you just need a new perspective. You already have the resources you need, but it is up to you to use those resources in a way that serves you. Others may be offering you help, or there may be an alternative solution you haven’t yet fully explored. Be open to finding the answer rather than getting stuck on the problem. The Eight of Swords is often associated with a victim mentality. You surrendered your power to an external entity, allowing yourself to become trapped and limited in some way. You may feel that it isn’t your fault – you have been placed here against your will. You may feel like the victim, waiting to be rescued, but is this energy serving you? If not, it is imperative you take back your power and personal accountability and open your eyes to the options in front of you. The fact is you do have choices, even if you do not like them. You are not powerless. At times, the Eight of Swords indicates that you are confused about whether you should stay or go, particularly if you are in a challenging situation. It is not as clear-cut as you would like, making the decision very difficult. You have one foot in, hoping things can work out, but your other foot is out the door, ready to leave. The trouble is that you worry either option could lead to negative consequences, and so you remain stuck where you are. Again, this card is asking you to get out of your head and drop down into your gut and your intuition so you can hear your inner guidance. Your thoughts are not serving you right now, but your intuition is. Trust yourself. The Eight of Swords reversed suggests that limiting self-beliefs plague you, preventing you from moving forward. You may tell yourself that you do not deserve to be wealthy, preventing yourself from receiving financial abundance even if it’s offered to you. Or you might conclude you are too old to lose weight, leaving you unhappy with your body and your health. The beliefs you hold about yourself are preventing you from achieving your personal goals. In light of this, change your belief system. Catch yourself when you are in a negative thought pattern and break the cycle. The Eight of Swords reversed also suggests that you are more prone to negative self-talk and suffering at the hands of your inner critic. You feel trapped because every time you try to do something, your inner critic tells you why it’s wrong or not good enough – so you give up trying altogether. The reversed Eight of Swords signals that skeletons in the closet need clearing out. Allow yourself to let go of the old patterns of behaviour and belief systems holding you back. On the positive side, when the Eight of Swords appears reversed, it can show that you are releasing yourself from negative patterns and belief systems. You can see the light at the end of the tunnel, and you can create a more positive reality for yourself by letting go of those self-limiting beliefs. You made it through a difficult time, and you are more open to change and self-acceptance. Reflect on what worked in the past and changed your perspective and approach. Acknowledge the options in front of you and refuse to play the role of the victim, taking greater accountability for where you are in life.